He's funny, he writes well, this was for charity. IMHO he set a standard early on that he has failed to reach with subsequent books but that's just me. And even an average Bryson is still pretty good. This one's about Africa BTW - candid and pertinent observations from a trip around. Touching, but too short; but then it WAS written for charity. I feel a bit of a fraud for not BUYING the book. Caught at tonight's Leeds Bookcrossing Meetup. I agree with Yorkygee, this book's too short, but I don't necessarily mean that I'd want to read more. It reads like a condensed version of a much larger book with a lot of interesting bits taken out and what's left, on the whole, are anecdotes about why he doesn't like light aircraft. A bit more about Africa and a bit less about him would have been welcome. Updated 2 August: On its way, as a RABCK, to gerbie7 after spotting it on their wishlist. Back from holiday: book in the mailbox, what a lovely homecoming. Thank you gothmarcus! Thank you, Gerbie7, for this lovely surprise! I am looking forward to it, this is perhaps the only Bryson I have not read yet. Being a fan, I wouldn't have wanted to miss this. I just love his style and his view on things. 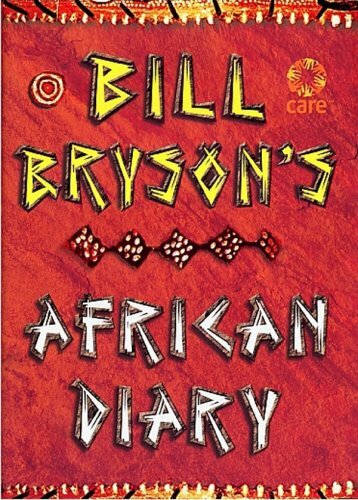 And if I were working for CARE International, I would be very happy to have my work and dedication described the way Bryson did in this book. Even if it is so short.